We talked in May and June about an older novel of mine, Shards, which came out in December of 2013, and how I suspected my book description for it was doing a terrible job of selling it due to a mismatch between the description and the actual contents of the book. And then we talked about how long it was actually taking me to re-write the description. But I am pleased to say that I am done, I have the go-ahead from the lovely people helping me re-write it, and that it has gone live on Amazon and Smashwords, and I assume will trickle out to the other distributors in the near future. Now to see if 1) this improves sales at all, and 2) if this improves review quality, since readers should go into the book with a better idea of what they’re getting. But I thought you guys might like to see the change. So I present, without further ado, the original description, and then we’ll do the new description. Eva Martinez isn’t sure why she’s pursuing a master’s degree in religious studies, except that something about the material resonates in the depths of her soul. But when her dreams start to be invaded by lost gardens, forbidden fruit, and a strangely familiar mystery man, even she has to wonder if she’s taking her schoolwork too seriously. Then Eva starts to notice the strangeness seeping into everyday life. The man from her dreams is real and Eva feels a curious connection with him. Her classmate, someone she’s known for years, starts to act increasingly volatile. And it seems like everyone, including her bosses, is keeping secrets…secrets that have something to do with her. Eva’s determined to find out what’s going on, how it involves her, and why she’s transforming into someone buried deep in her memories. The deeper in that Eva gets, the more she feels like she should understand what’s happening around her. The secrets conceal real dangers, and if she can’t untangle them and find the truth in time, she–and all those she’s come to care for–will face defeat at the hands of an ancient enemy, one who recognized Eva long before she learned to recognize herself. But Michael’s kind—angels—are forbidden to join with humans. And Eva has attracted the attention of Michael’s ancient enemy—the one who took his first love from him. He couldn’t protect her, so he’s determined not to let the same fate befall Eva. But can their relationship survive all he’s not telling her? Ta-da! Now we wait and watch, and see what comes of this all. Also, just a reminder that Shards is on sale for $1 at Smashwords through the 31st, and Hidden Worlds is free. Howdy, Squiders. This is just a quick note to let you know that the discussion of The Ancient One will be next Tuesday, August 2, instead of this Thursday, July 28. See you then! Today, Squiders, I’m pleased to host Kathleen Ann Gallagher as part of her book blast for her new book, Night Magic, which is the first book of the Moonlight and Jasmine Series. The book is contemporary paranormal romance. The book is currently discounted to $.99 during the blast. You can buy it here. We’re doing a sewing analogy today, Squiders. Sorry. Well, I couldn’t use them as is. I remembered, as I stared down at all those pattern pieces, that I have to modify the patterns, usually extensively, because I am 9 inches taller than the average woman. I have to length everything. I have to change where the darts go. Sometimes I have to completely reshape a pattern. And then I realized I probably hadn’t bought enough material for one of my planned shirts and had to go make myself some tea. The same thing goes for writing. Have you ever read a book where parts of it felt derivative? Like, instead of spending any time on a character, the author just used stereotypes? Where, instead of focusing on a good-fitting setting, they just grabbed the status quo, even in places where it didn’t make sense? It can be tempting to take shortcuts sometimes. To use the default setting, because it’s expected and familiar. To grab the usual bag of characters, because you know how they fit into a plot and why invent the wheel, right? And sometimes it’s okay to use the pattern. There are reasons patterns exist. They do work. But it’s important to make sure you’re using the right pattern for the story that you want to tell, and if it’s not fitting right, it’s okay to modify it. The fit is what’s important, in the end. If your story ends up too long, too short, lumpy in odd places, too tight, too loose–all things that can be fixed with a little modification–your readers will notice. And next time they’re looking for a well-crafted, good fitting story, they’re going to go somewhere else. Have you ever tried to use a standard bit of plot/setting/character and found it just didn’t fit? What ways do you employ to fix the fit? I sometimes get questions in my email from other people wanting to get into freelance editing, and so I thought it might be beneficial to share my general day with the Internet at large so people can get an idea how this works. I do want to emphasize that this is me, personally, and that there are plenty of other good freelance editors out there who probably structure their day completely differently. Also probably plenty of bad freelance editors, which is why you should ask for an editing sample before you hire someone. I also want to preface this with the disclaimer that I work part-time because I am first and foremost a stay-at-home parent with two pre-school children. On a good day, I can get up to six hours of working time in; on a bad, I may only get an hour, or even nothing. Freelance Editor (website here) — I specialize in novels and short stories, but also get a lot of college papers and technical documents because of my background in engineering. Contract Editor — I’ve worked for a company for almost five years now, where I currently edit college-level lessons before they go live on the website. Grant Writer — In February I was hired by a local performing arts school to write grants for them. We’ve won two of the grants we submitted for already, so not bad for taking over a job I had absolutely no previous experience with. 6-6:30: Get up. This varies based on when I went to bed. If I’m going to go to the gym first, I get up at 5:45. It’s completely random as to whether or not I will get dressed or just shuffle downstairs to work. 6:45-8:00: Working time. This is my most reliable section because my charges are still asleep. Usually. Hopefully. Unfortunately, it also tends to be my most unfocused. I normally get started fine, but then get distracted with administrative stuff, such as checking on blog tours, marketing stats, and reading emails. 8:00-10:30: Very little, if any work, gets done in this time frame, so I tend to spend this time with the kids and on things like laundry, dishes, yardwork, etc. Sometimes they’re distracted and then I can sneak some stuff in. 10:30-12:30: The smaller one usually naps at this point, and the bigger one is in school on some days, so this is another, and probably my most productive, working time. If I’m working two jobs at once (which is fairly common; at the moment I’m doing my contract editing and editing the second book in a series for a client) I tend to do one job in the first thing in the morning slot and then switch to the other for this slot so forward progress is being made on both. If one has a tighter time frame, however, I will work that one in both slots. 12:30-3:30: House stuff again. The kids and I normally play a game or do a craft. We also run errands at this point. Often to the library. We apparently have 26 books checked out of the moment. 3:30-5: This is a potential working period. It depends on when the littler one took her nap and if she needs another one (she might go down earlier or later, depending, but sometimes not at all), and if I can distract the older one without just plopping him in front of the TV. Sometimes I can enforce quiet time with him (he should nap, but won’t) which is lovely. But rare. 5-8: Dinner and family time, usually. 8-10: Wildly variable. Sometimes I can swing this for working, but a lot of times I’m just too tired. If I do get working time in this period, I tend to prefer to work on my fiction projects instead of paying ones. It tends to depend on deadlines, but I try to work far ahead so I’m not stressed. I also get a lot of questions about pay rates, and to that I say: make sure you’re asking enough to justify your time. A lot of starting freelance editors ask for or will take basically nothing in an attempt to garner business, and you’re not really doing yourself any favors. I’ve found that clients who insist on cheaper rates are ones you really don’t want–they’re abrasive and rude, and don’t respect you as a person or a professional. Counter-intuitively, potential clients may also pass you up if you’re too cheap because they think you’re not good or not experienced, and that’s why you’re not charging more. I have a flat rate for developmental/concept editing, and I charge a sliding scale for proofreading/line editing, depending on the state of the manuscript. Some people have a pretty clean document with only a few stray punctuation marks or typos throughout. Other people still put a carriage return at the end of every single line like a typewriter and write purely in run-on sentences. So, there you go! Let me know if you have any other questions. Siri’s and my longer blog tour for City of Hope and Ruin starts today! Our first stop is an interview with me, which can be found here. We’re giving away another $50 Amazon giftcard during this one. Last week we talked about focus, Squiders, and my lack of it lately. I am pleased to say I am getting somewhere now! Well, sort of. I was somewhat waylaid bad a nasty bout of vertigo over the weekend, which was not fun and seems to be lingering a bit, though it’s mostly gone at this point. I’ve also got a bit of headache, but I’m not sure that’s related. But other than that, progress! But not necessarily related to writing. Write and edit a short story for an anthology, due July 15. Get to the conflict remapping stage of the edit/revision on the first draft of my Trilogy book one. Finalize the new description for Shards. You might also remember about three weeks ago when I said the sewing bug had come a-biting. You might also also remember that the larger, mobile one is out of school and we are all going insane. So, where have I made progress? Well, I have made some writing progress. I’m at about 7K for my story, which is probably about 60% done. I’ve been writing about 1K a day on it, so I should hit the deadline on Friday. One of the first steps that I do on the revision stage of a book is to look at all the characters and make notes for tweaks/identify issues that need to be fixed. This is a high fantasy trilogy, so there are a lot of characters. I am finally done with that. I’m now ready to start tackling plot issues (of which there are many). I sent the hopefully final version out to the two people who have been helping me. Unless they come back with something major, this is probably done. Yay! On the sewing front, I took the smaller, less mobile one to the fabric store on Friday, where we bought patterns, fabric, and necessary accessories. The larger, mobile one and I have been doing crafts, trying to do it daily for our own sanity. 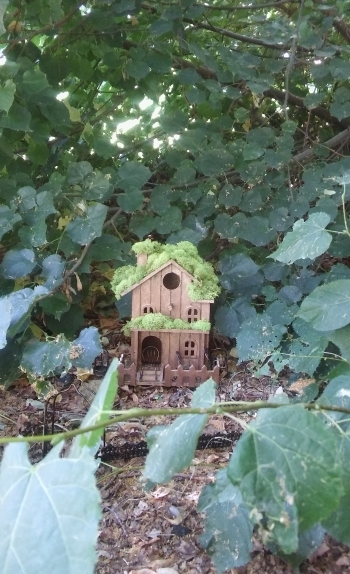 So today we finally put our fairy house out in the garden (we’ve been working on for about a month) since we got the furniture in the mail, and we also made fabric bracelets, which was a bit of a fail, since mine are too big and his is too small. Alas. 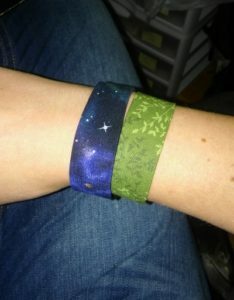 Here’s pics, though. Man, the captions look terrible on this platform. Blegh. Gotten anything useful done lately, Squiders?